In search of the right adjustable height desk but don't want to strain your wallet to upgrade your office? 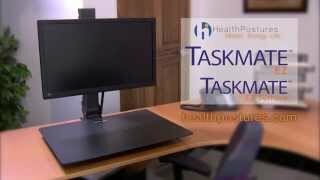 The affordable and functional Health Postures TaskMate EZ 6400 is ready to elevate your work style, starting with your monitor, keyboard, and mouse. Work in a better position for your body - adjust to your height preferences with the built-in notched bracket system that lets you tilt, lift, and lock into your desired sitting and standing positions smoothly and easily. Work surface dimensions 23.5" W x 18" D"
The Health Postures TaskMate EZ 6400 includes a simple, sturdy bolt-through system for desk mounting. An optional clamp mount can also be included to allow for mounting without the need for permanent desktop modifications. $268.00 List Price: $299.00* The list price is the same as the MSRP (Manufacturer's Suggested Retail Price). It may not necessarily be the price at which the product is sold.